Not quite two years ago, in Science: Protection Against Novel Flu Subtypes Via Childhood HA Imprinting, we looked at new research which suggested the influenza HA Group type you are first exposed to makes a significant, and lasting, impression on your immune system. And that the resultant immune response may carry over to other - similar - subtypes. This has ramifications for pandemic planning, and may well determine how well you will fare during the next pandemic; depending upon the pandemic strain, and the virus you were first exposed to early in life. The idea isn't new, and the concept goes back nearly 60 years to research by Epidemiologist Thomas Francis, Jr. in his article On the Doctrine of Original Antigenic Sin where he postulates that when the bodys immune system is exposed to and develops an immunological memory to one virus, it may be less able to mount a defense against a subsequent exposure to a second slightly different version of the virus. This work is often mentioned when discussing the increased risk of seeing more severe illness when infected with a second or third serotype of Dengue. 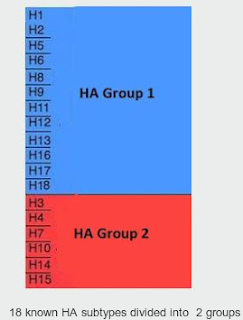 Up until relatively recently, we thought of influenza viruses as being grouped primarily by HA subtype; H1, H3, H5, H7, etc. But, as the chart at the top of this blog shows, the 18 known subtypes are divided into two basic groups; Group 1 and Group 2. And recent evidence suggests that the first HA group you are exposed to may determine your ability to fight infection by viruses from the other group. With the two biggest avian flu threats coming from different HA groups (H5 belongs to Group 1, and H7 belongs to Group 2), your first flu exposure could well determine how well you will fare during an avian flu pandemic. Those alive today who were born before 1968, when H3N2 began its reign, their first flu exposure was almost certainly group 1. Those born between 1968 and 1977, group 2. Those born after 1977, could fall into either category. Which suggests, if your first influenza exposure was to H1N1 or H2N2 (group1), you may carry some degree of immunity to the H5 viruses (H5N1, H5N6, etc.). If, however, your first exposure was to H3N2 (group 2), you may carry some protection against H7N9 instead. And indeed, the generally younger demographic of H5N1 cases and deaths compared to the great impact of H7N9 on older victims (born prior 1968), seems to follow the pattern (see Eurosurveillance: H7N9 Virus-Host Interactions & Age Shift). While all of this makes sense when you look at it, things are rarely as simple as they first appear. Last January, in mBio: Pandemic Paradox - Early Life H2N2 Infection Enhanced Mortality From H1N1pdm09,we saw a study finding those born during the 1957 H2N2 pandemic saw the highest mortality (see mbio chart below). H1N1 and H2N2 are both group 1 HA types, and some cross protection might be expected. Also, the mortality rate dropped for those born after 1957 - when H2N2 was still circulating - and didn't spike for those born during the 1968 pandemic when H3N2 (a group 2 HA type) was the only influenza A game in town. While none of this invalidates the previously described HA Group type cross-protection theory, it does suggest there is more involved in this first imprinting than we currently understand. Delving far deeper into this topic than I ever could, we have Declan Butler's excellent feature report in Nature today, which looks at this emerging field of study, and how understanding the way it works may hold the key to creating better flu vaccines in the future. Follow the link to read the feature article, and an accompanying editorial, in their entirety. Your first bout of flu may determine how you fare during the next pandemic. Thats why scientists are trying to understand immunologic imprinting.